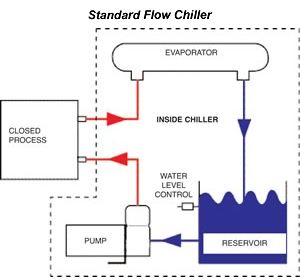 Determing the correcct style of chiller flow circuit is just as important as matching chilling capacity to a given process. The following explains the major differences between the two types of flow circuits. Advantage standard flow chillers are intended to be used on closed loop processes, such as molds, rolls, dies, coils, etc. 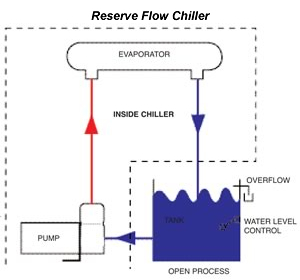 Water returning to the chiller is dependant on flow generated initially by the chiller process pump. If the loop is open to the atmosphere at any point, such as an extrusion trough, overflow will always result. Advantage reverse flow chillers are designed specifically for open circuit processes. Notice that the flow circui remains basically the same but the process acts as the chiller's reservoir and gravity returns water to the pump suction. System water make-up and level control is accomplished externally at the process since the chiller contains no reservoir. Turn on and off individual units. Would you like to Download FYI #011 to your browser?